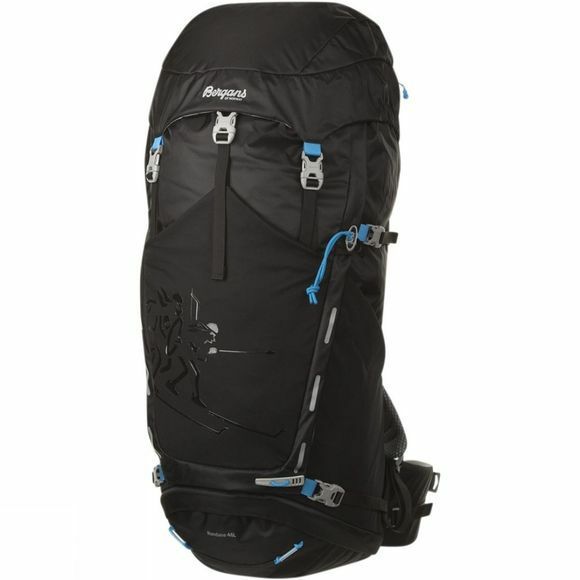 The Rondane 46L Rucksack is a versatile daypack suitable for a huge range of activities and could even be stretched to lightweight overnight trips. The QuickAdjust harness is easy to adjust to ensure you get the right fit each time regardless of who has worn it before and the ventilating foam with mesh surface is excellent at keeping you comfortable throughout the day. The pack can be divided into two separate compartments, one of which can be accessed via the top opening with spindrift collar as well as via a full front zip opening while the other is accessed through the base opening. There is also a small internal zipped pocket on the lid which is great for keeping smaller items organised and a comfortable hipbelt allows you to move freely while bearing the weight of your pack. Compression straps at the side are handy to stabilise your load if the pack isn't full and there are attachments points for extra kit such as ice axes and hiking poles as well as lights that you might want to add to help increase your security when out at night.